Have I mentioned in these posts about our vacation to New Hampshire and Maine what a good sport Jamie was about being dragged to covered bridges and lighthouses? Chances are good, that's not exactly the dream that vacations are made of for 17-year olds but she really did well with the whole trip and didn't complain once that I can recall. 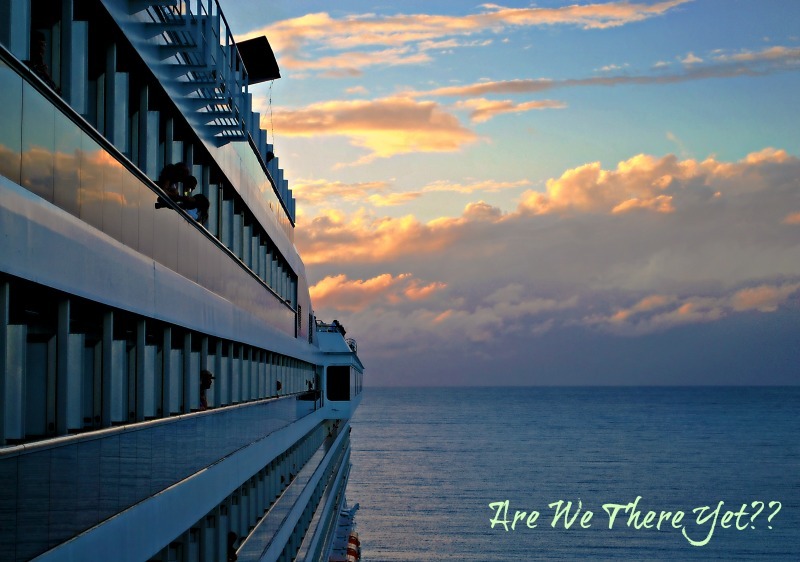 Of course, we went on the vacation two months ago so I may have forgotten if she complained but I'm pretty sure she didn't! Anyhow, I wanted to make sure we did a few things that she'd enjoy (like the Fryeburg Fair way back in Part Twelve of these posts!) 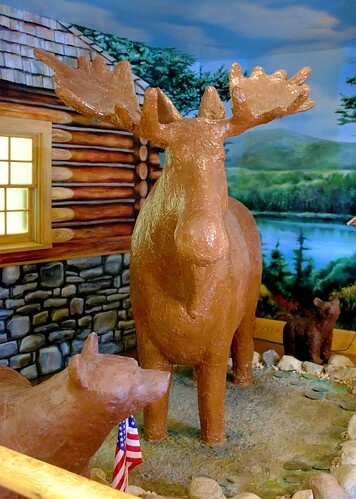 and that included a stop at one of Maine's "sweetest" attractions. Len Libby Candies is located on Route 1 near Higgins Beach in Scarborough, Maine - a bit south of Portland. 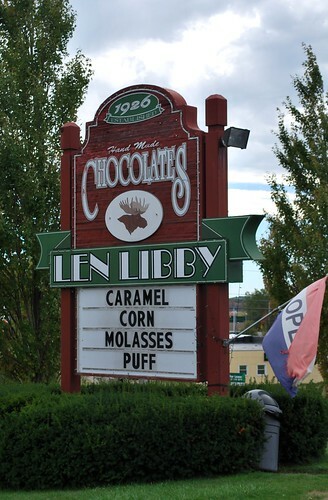 When the business first opened in 1926, it was owned and operated by its namesake, Len Libby, who had opened his own shop when he retired after working as a master candy-maker in Portland for several decades. 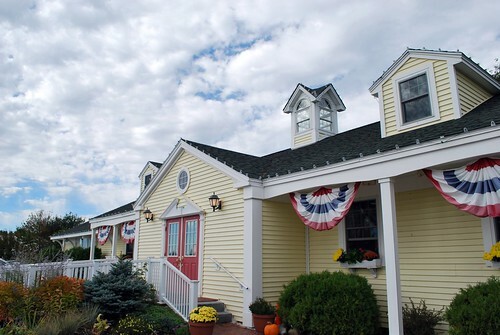 In 1949, the business was sold to Fernand Hemond who had begun his apprenticeship as a candy-maker while still in college at the Higgins Beach shop. When he took over the business, Fernand promised to continue to run the shop using the original recipes and traditions that had been taught to him by Len Libby and to this day, he has kept that promise. So ... you may be asking yourself what makes this candy shop any more special than any other candy shop, right? Simple! 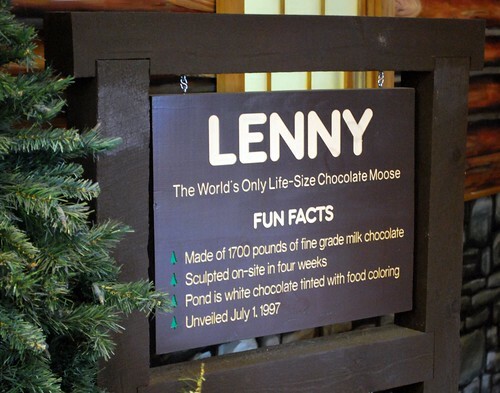 This candy shop is home to Lenny, the world's only life-size chocolate moose! I first heard about Lenny from my cousin Amy who had shown me pictures of him from when she had made a weekend trip to Maine with her friend Vanessa this past summer. Having not seen any other moose on our journey through Maine, I figured this might be Jamie's only chance to see one so we stopped in. Honestly, pictures do not do Lenny justice as he's really quite a large fellow standing there in his white chocolate pond! 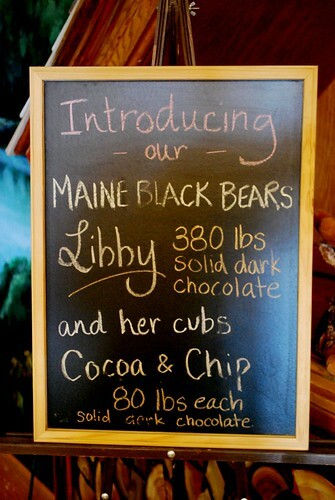 Joining Lenny is Libby, a Maine black bear, and her two cubs - Cocoa & Chip. Mama Libby is in the middle in the picture below but I'm not really sure which cub is Cocoa and which one is Chip! 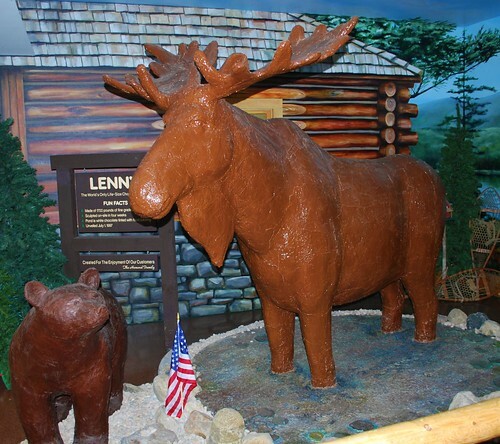 In addition to being home to a 1,700-pound chocolate moose, Len Libby Candies sells some very tasty treats including taffy, truffles, fudge, and chocolates in all sorts of shapes including lobsters, moose, seashells, and - my favorite - lighthouses! Oh, and may I highly recommend the Pecan Caramel Popcorn which was absolutely delicious! Jamie's favorite was a chocolate-covered s'more that she made short work of though I did get a small taste and it, too, was quite delicious. All in all, it was a very sweet break before we went back to hunting the Maine coast for more lighthouses which were a lot easier to find than moose - real or chocolate! MWM would be in his element visiting that place - he adores chocolate and candies! a woman after my own heart in this post. BEAUTIFUL...and chocolate! What Lois said! 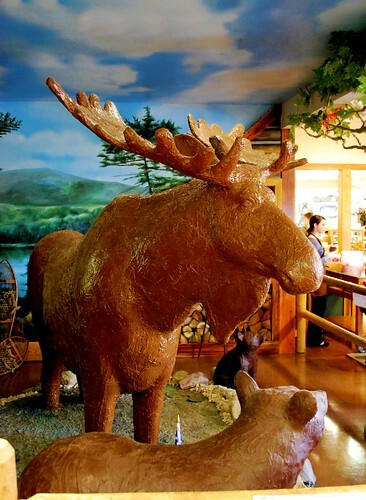 Chocolate Moose... hahahaha! And I have to wonder how they've kept them from changing color after all this time. They must've coated them with varnish or something. I love chocolate mousse, but this guy is a close second. Like Barb I was wondering how they keep the chocolate animals looking chocolate-y.. Cute post! I am so far behind in my visiting. I must catch up with your posts. I love chocolate. A. Lot. I would have had to stop here and sample a bit of this and that. What a fun place. They better be coated in something inedible or someone is sure to chomp on an antler.